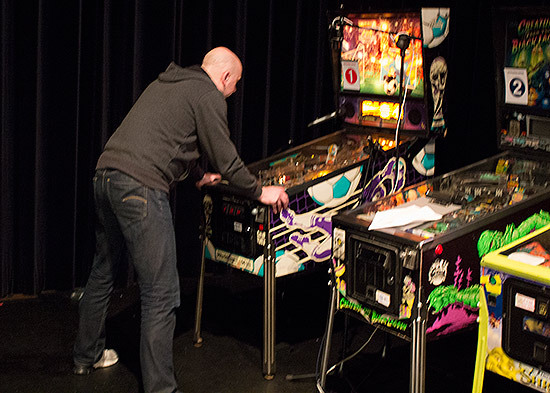 The annual Dutch Pinball Open took on an expanded form this year, with the introduction of seminars, two special guests, and expansion into an adjacent hall. 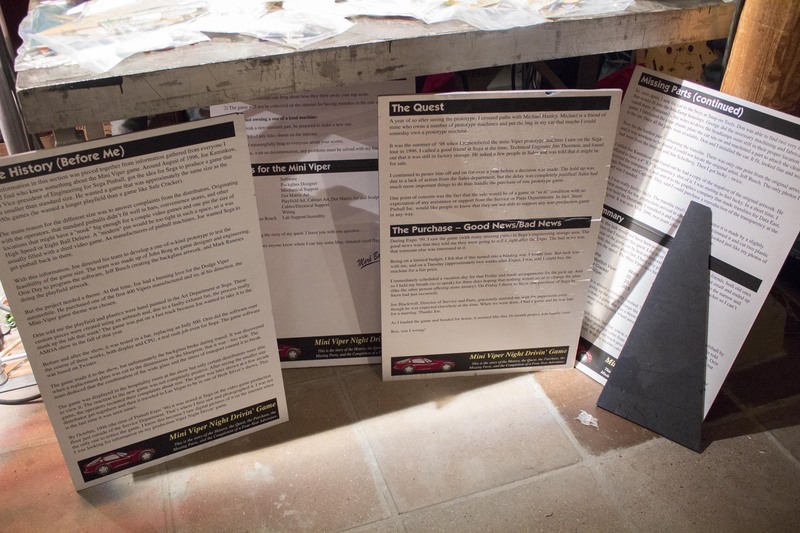 Together these created the first ever DPO Expo. Many things were unchanged from previous years though. 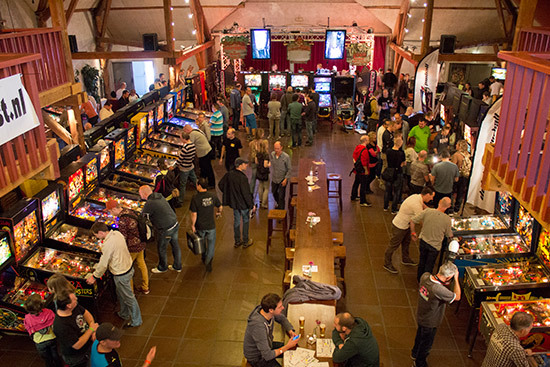 The event is still run by the Nederlandse Flipper Vereniging (NFV, or Dutch Pinball Association), and the venue was the same as 2013 - De Voorste Venne in the southern town of Drunen. 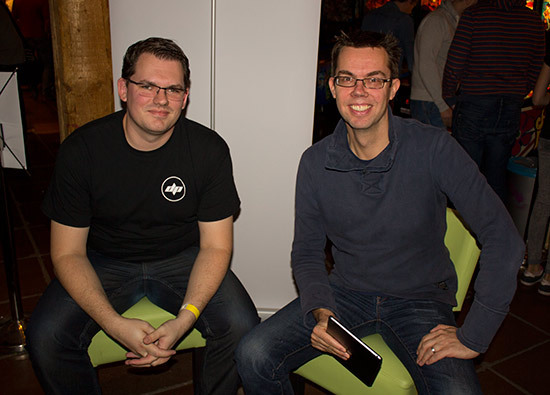 Usually the DPO is held in different parts of the Netherlands each year, to make it more accessible to NFV members from across the country. However, last year's venue was seen as having great potential to host a larger DPO event, so it, and we, returned to the former car museum in 2014. As you can see, the skies were clear and the temperature was unseasonably warm for the start of November, allowing guests to enjoy the outside seating. 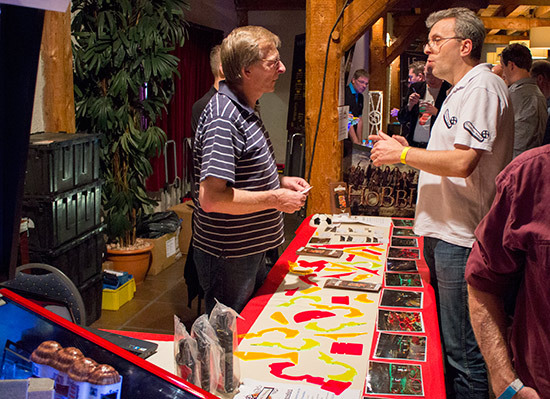 Entry to the DPO Expo event cost €15 ($19, £12) for Saturday and €10 for Sunday. Separate tournament entry costs applied on top of the show entry. Payment could be made in advance or on the day once the door opened at 10am. Just beyond the entry desk was a stand selling NFV-branded merchandise such as caps, T-shirts and hoodies, as well as entries for the classic tournament. 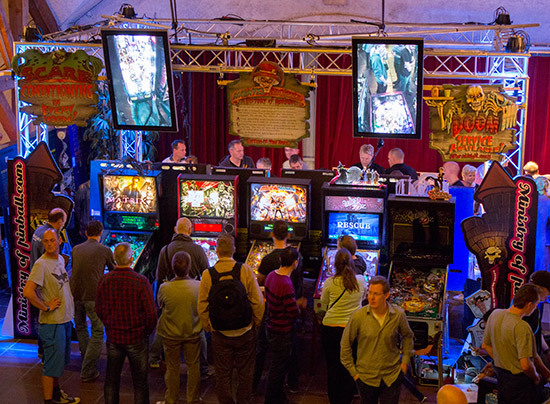 Opposite the merchandise stand was the bar, in front of which was the hall's main space where majority of the free play machines and vendor stands were set up. 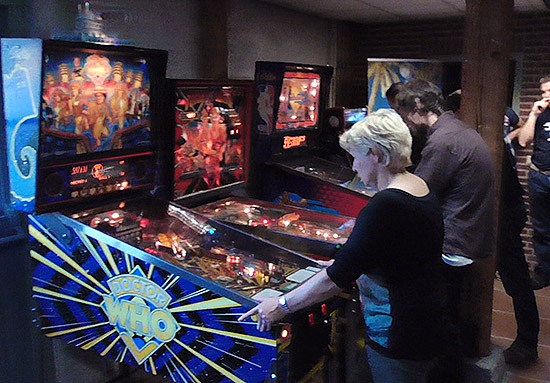 On the far left was an area reserved for the Steve's Classic Match tournament, which was played on six machines designed by Steve Ritchie who was a guest at the DPO Expo. The machines available were High Speed, Black Knight 2000, F-14 Tomcat, Firepower, Flash and Black Knight. We'll have more from this tournament a little later in our report. All the other machines in the hall were set to free play, and just beyond the tournament machines we find the first block of these. 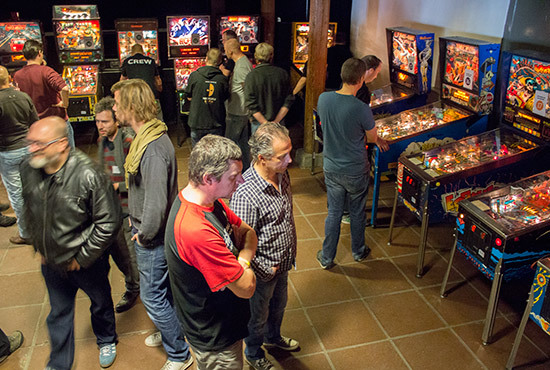 At the back of the hall was a section occupied by Ministry of Pinball who had back-to-back rows featuring eleven of the newest Stern and Jersey Jack machines, including two The Wizard of Oz games (one Emerald City and one 75th Anniversary), The Matrix, The Walking Dead, the Medieval Madness remake, and a mini Sega Viper, together with their regualar parts sales stand. The mini Viper is owned by Bas Verhoog, and it was accompanied on the stand by some information boards from previous owner, Mark Bakula, detailing the machine's history. 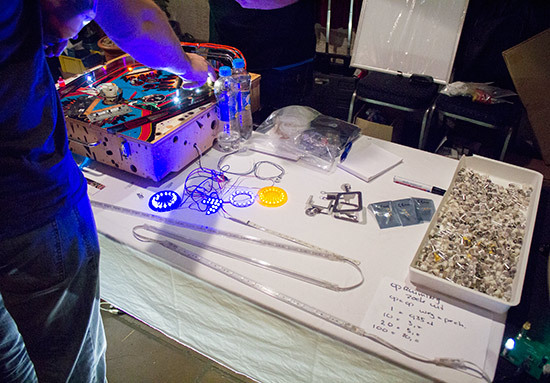 Next to Ministry of Pinball was a stand from the Silver Castle Pinball team who were showing their progress so far turning Timeshock! into a real machine. We'll hear more about the Timeshock! 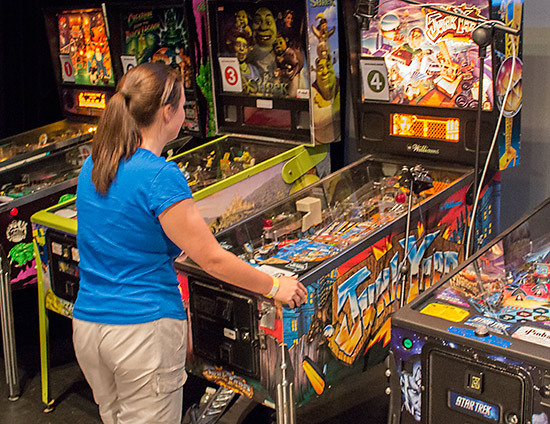 project in the seminars section, but while on the Silver Castle Pinball stand we ran into Dutch Pinball's Koen Heltzel talking with Timeshock! 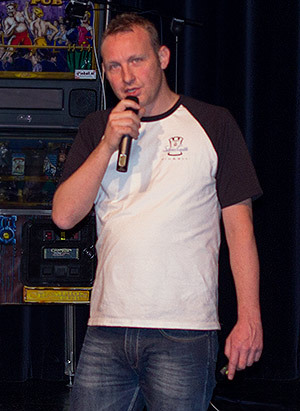 's originator, Adrian Barritt. 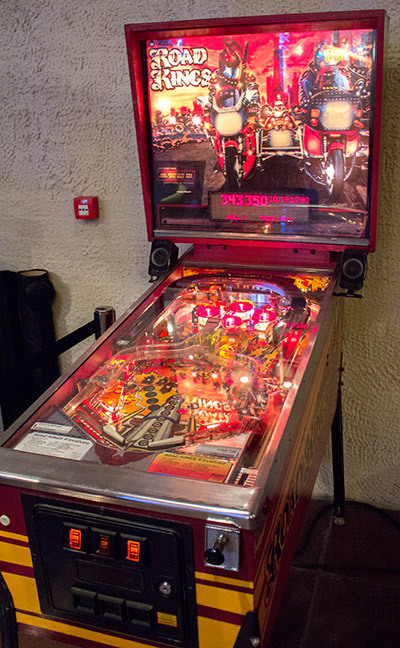 Next to the Silver Castle Pinball stand was the P-ROC Road Kings created by Steven van der Staaij and Silver Castle's Pieter van Leijen. 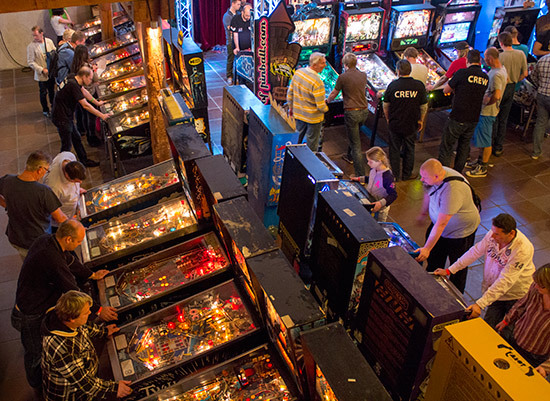 The block on the right of the hall contained many more free play machines, and another selection of vendors. 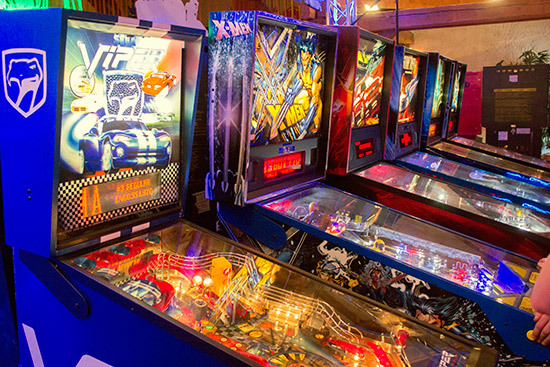 Chief amongst them was Dutch Pinball who had two The Big Lebowski machines as well as their Bride of Pinbot 2.0 with new rules and a colour display. 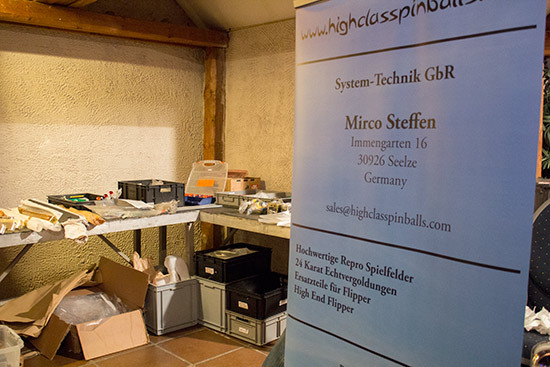 Mirco Steffen's High Class Pinballs had a stand on the right wall of the hall, selling original and reproduction pinball parts and playfields. Jersey Jack Pinball's master distributor for Europe Freddy's Pinball Paradise had the next stand along. They brought a production The Wizard of Oz 75th Anniversary and a prototype The Hobbit. They were also selling sets of their fluorescent plastic protectors which we reviewed here. 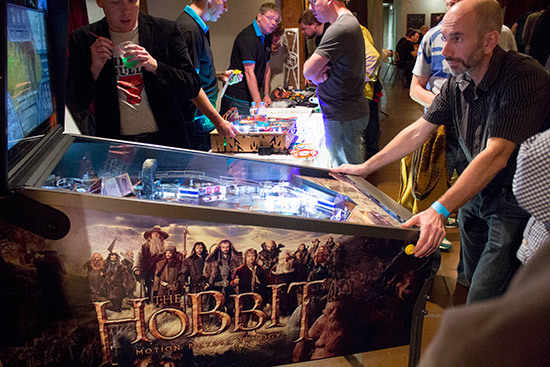 The Hobbit will be having some significant changes to the playfield before it goes into production, including new artwork, different models, removal of some elements, the addition of some major new playfield items, and even some new shots. 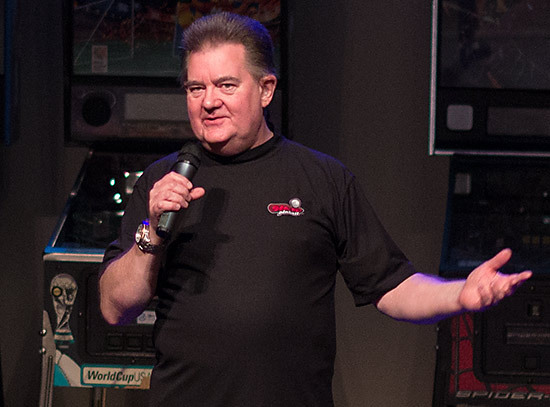 Jersey Jack Pinball's Jack Guarnieri was also at the DPO Expo, and we'll hear from him in the seminars section. Next to Freddy was LED4Pin who, as their name suggests, were selling replacement LEDs and LED game enhancements, as well as hole and scoop protectors. 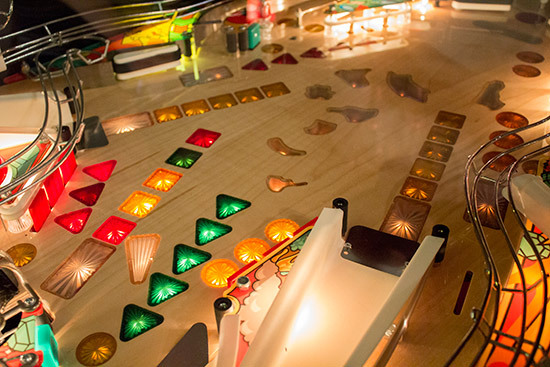 Those interested in trying out their LEDs could test them on a sample section of playfield to see how they would look in a game. 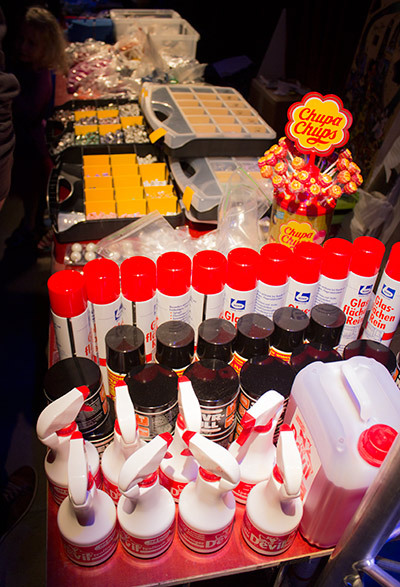 Two additional vendors were only at the DPO Expo on the Saturday. 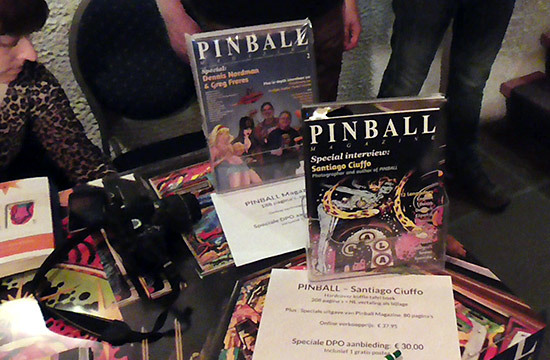 Jonathan Joosten had a stand for his Pinball Magazine publication and Pinball book by Santiago Ciuffo. He was selling both, along with posters of Santiago's pictures, and Santiago was there in person to sign them. 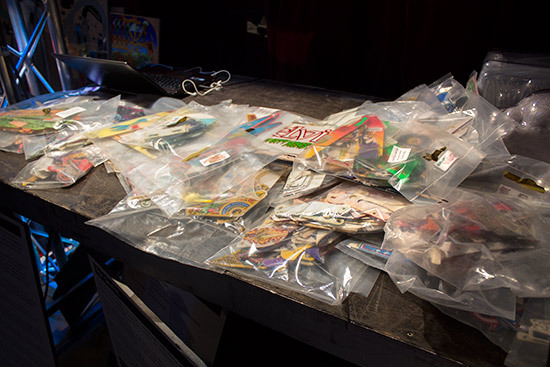 Adriaan van Roeden was also there on Saturday with a selection of his Tiny Pin miniature pinball models and a display showing all the different pieces which are used to make one of the miniatures. There was no shortage of machines at the DPO Expo. 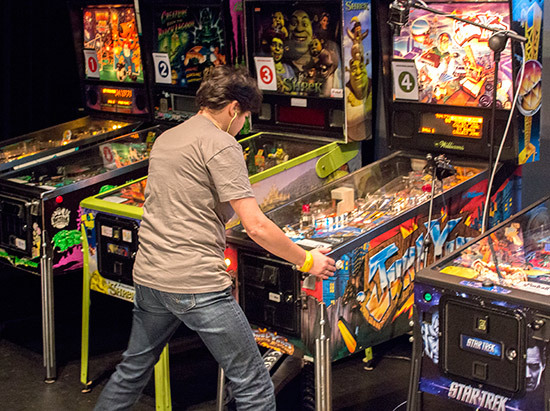 Some additional games were located in two passages which connected the main hall with the theatre. 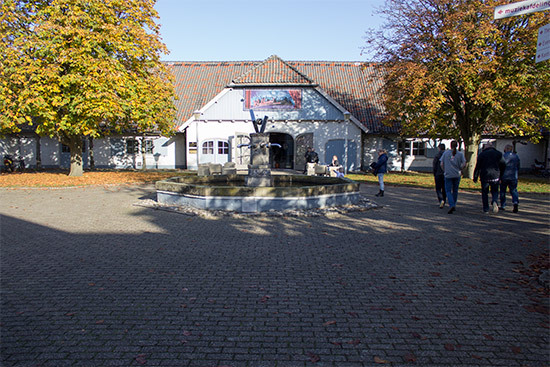 These corridors linked the main hall with the theatre, where the seminars and the finals of the Ladies Tournament, the Youth Tournaments and the main Dutch Pinball Open were held. 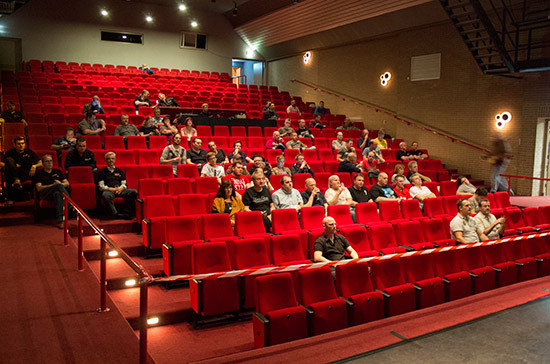 The theatre provided an attractive setting for both the seminars and the tournament finals, with plenty of comfortable seating and a good projector and screen. We'll return here shortly, but we're not quite finished showing you around the venue. 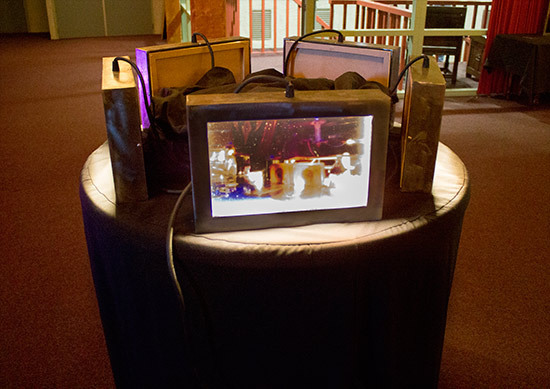 The main hall had a gallery section overhead where visitors could look down on the show and take pictures. 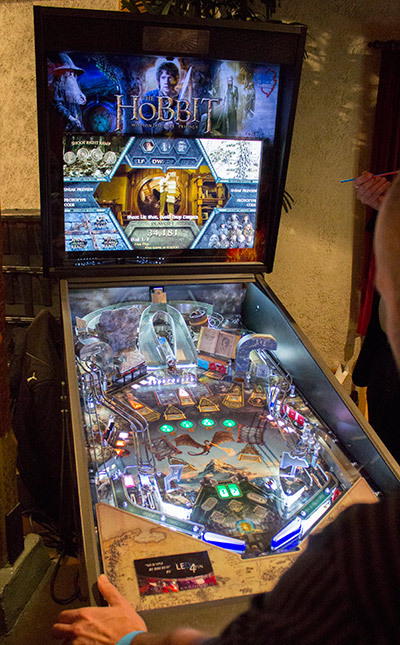 It also featured a display of pinball artworks by Peter Bracke called his Theatre of Magic. 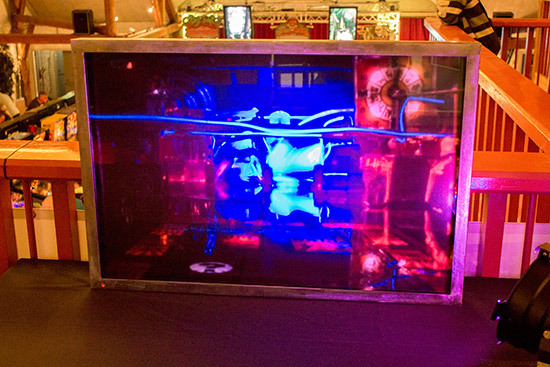 There were several smaller backlit display boxes, and a couple of larger pieces. 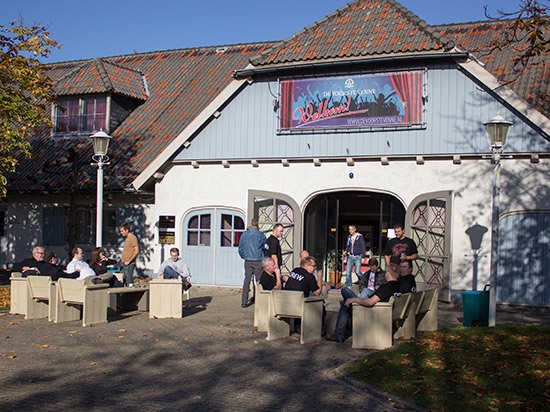 To get to the main Dutch Pinball Open machines, it was back downstairs, out the front door and across the courtyard to a separate building at the front of the property. 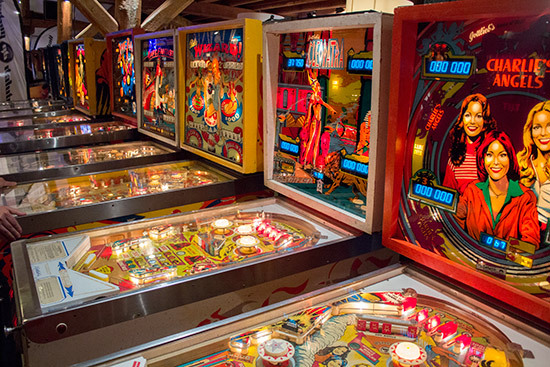 Twenty pinballs were set up around three walls on the left side of the room. 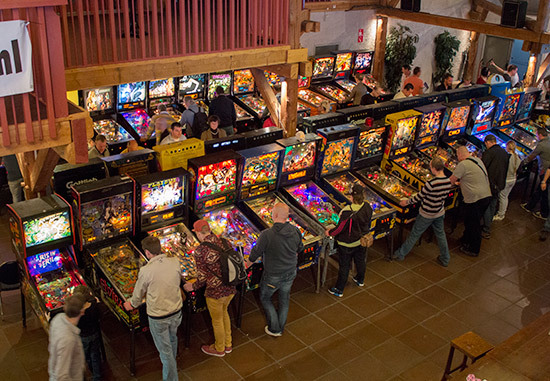 These machines were used for the team tournament on Friday and Saturday night, and for all rounds of the Dutch Pinball Open except the final which moved to the theatre. 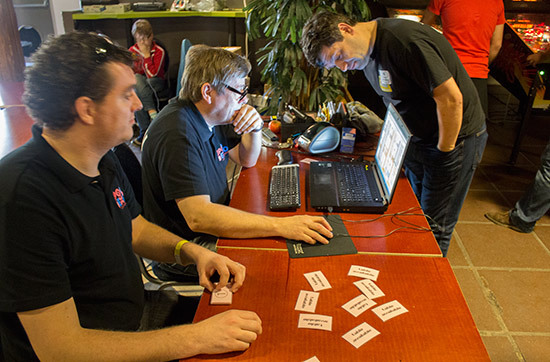 In the centre of the room were the results screens and the tournament desk from which tournament director Ad Jonker looked after the scoring system and announced the start of each new round. 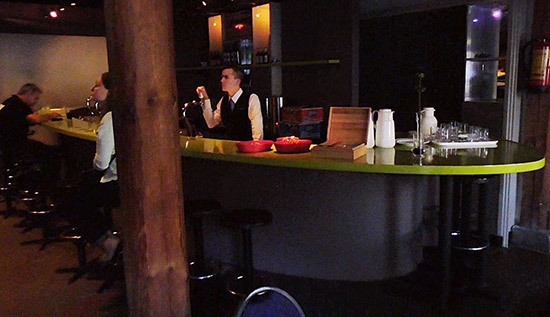 On the right of the tournament room was a second, rather more limited bar which served hot and cold drinks throughout both days of the show. 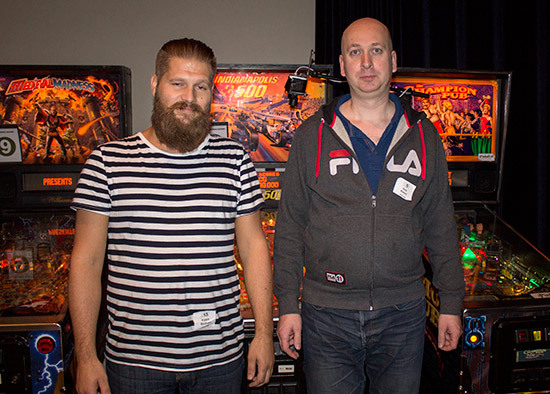 In all we counted 153 machines to play at the DPO Expo. That's 20 for the DPO, 6 more for the classic tournament, and 123 free play machines. 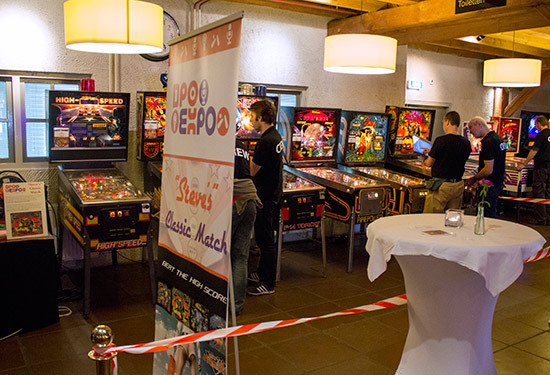 You can see the whole DPO Expo set up for yourself with our exclusive Thirteen Minute Tour of the De Voorste Venne complex, taking in all the machines, tournament areas, and vendors. One of the major additions this year was a programme of seminars. These were introduced by Gerard van de Sanden who came up with the original idea for an expanded DPO and arranged the seminars. 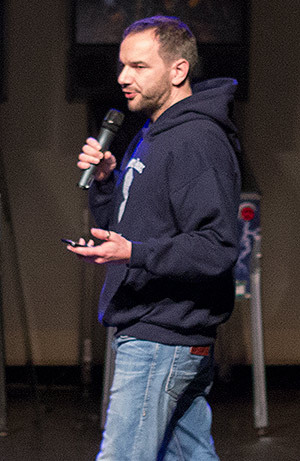 He appeared as The Dude alongside other DPO organisers to recreate the bowling scene in The Big Lebowski, and introduce the first speaker. 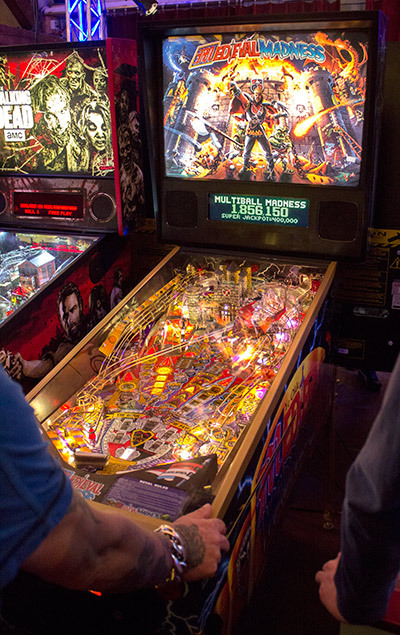 12:30pm Silver Castle Pinball - Timeshock! 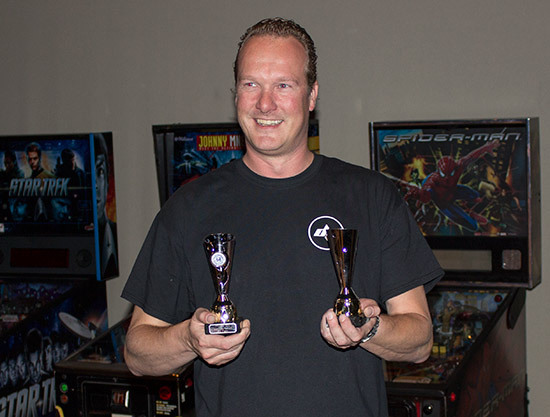 Pieter van Leijen from Silver Castle Pinball spoke about the company's plans to turn the Pro Pinball classic Timeshock! into a physical game, and started by introducing the various members of the team and the skills they bring to the table. 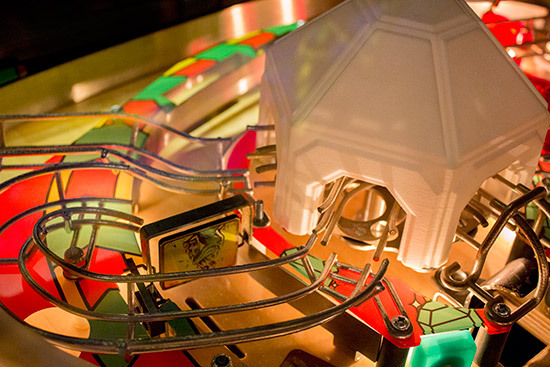 He explained the storyline in the game and the rules and modes which result from that, before turning to how these are represented on the playfield. 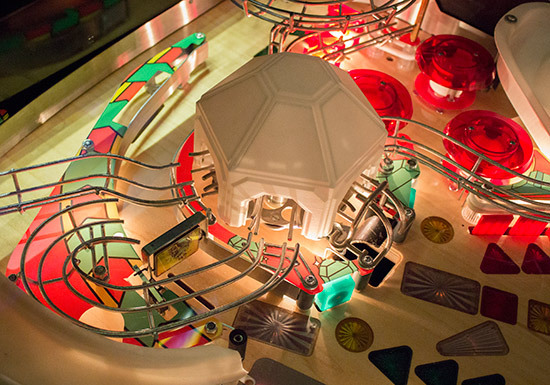 Pieter then described some of the difficulties the team encountered in making those playfield features function both above, and more importantly, below the playfield where the original 3D model had no mechanisms. 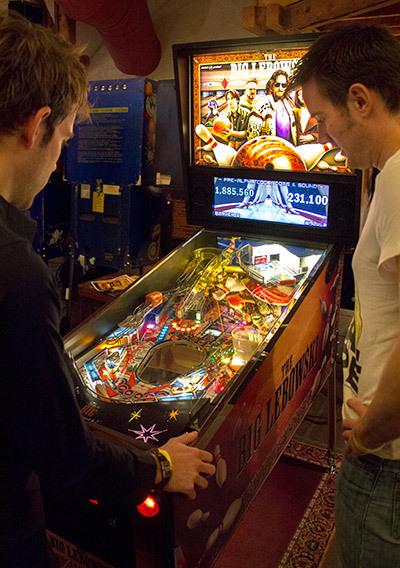 The team are determined to make the real game follow the computer version as much as physically possible. 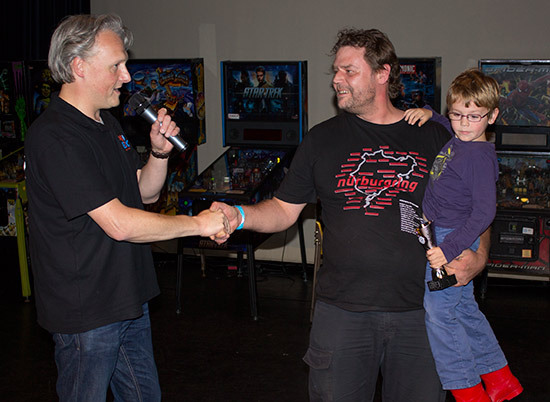 Pieter then handed the microphone to the creator of Timeshock!, Adrian Barritt, who was at DPO Expo with the Silver Castle Team. 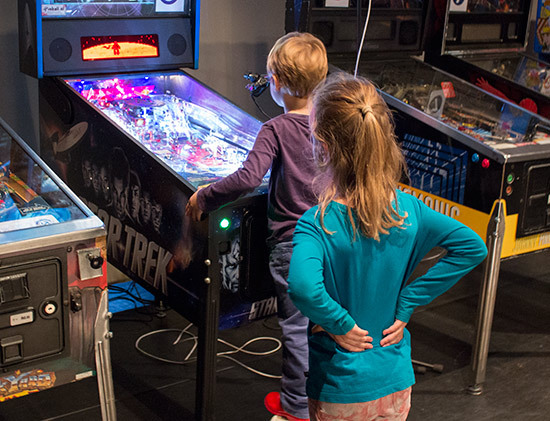 Adrian talked about the beginnings of the Pro Pinball series in 1995 when he and his colleague bought their first pinball machine - a Star Trek: The Next Generation. 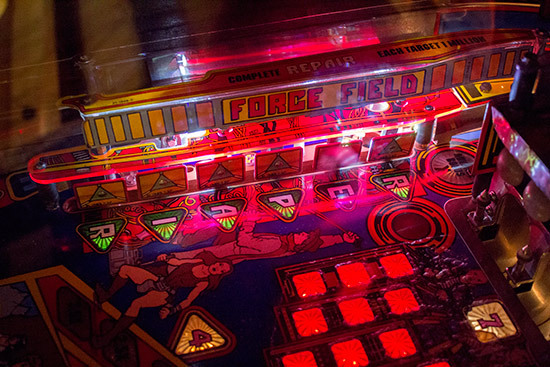 They investigated making a computer version of that table - a deal that never happened, but it led them to make the first Pro Pinball game, The Web. 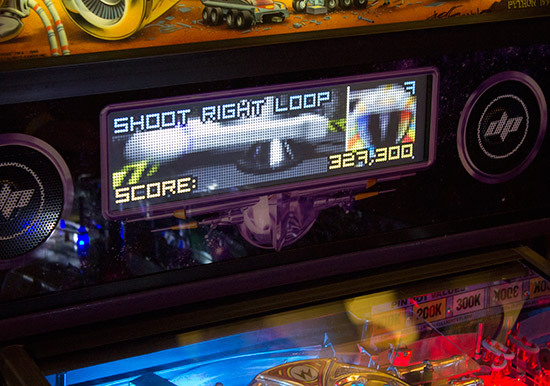 They wanted to make something bigger and better for their second game, knowing other companies were also developing their own pinball simulations, and that led to the creation of Timeshock! He said they wanted their simulations to be totally realistic, so the games were designed with the theoretical ability to be built for real in mind. 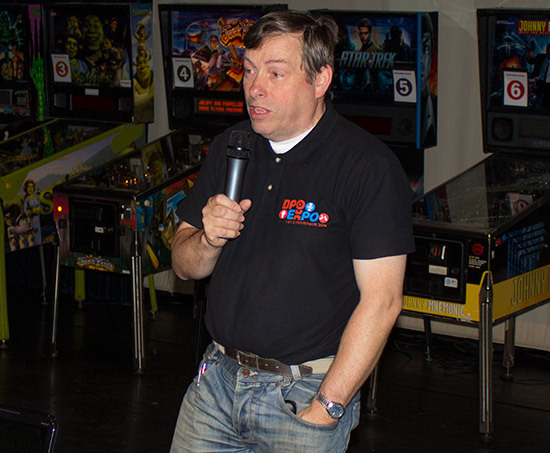 Jaap Nauta began his presentation by explaining how he wasn't expecting to be speaking, but had been asked to host the seminar at short notice after Phil, who hosted their seminar at Pinball Expo, wasn't feeling well and had to go home. 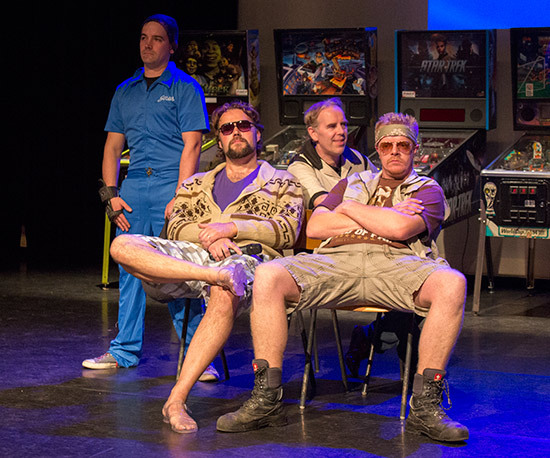 It later transpired that Phil had left the Dutch Pinball team that weekend. 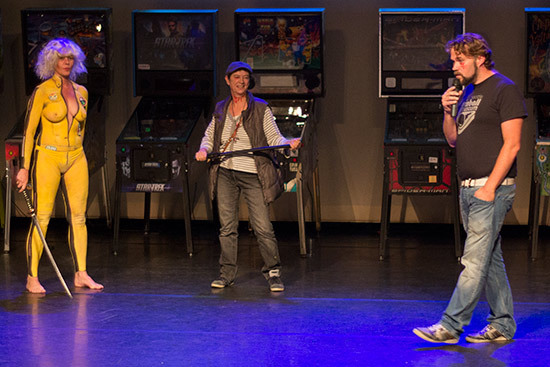 Jaap spoke mainly in Dutch, and described how the team came together and used the Bride of Pinbot 2.0 project to prove to themselves how they could create a ruleset, programme it, make the display animations, and the sounds and music. To make most of the elements needed to create a full game. Japp said they decided to partner with a manufacturing company rather than get involved in building games themselves. They currently have five prototype machines; two in Europe, three in the US. Note: This seminar is mostly in Dutch with occasional sections in English. 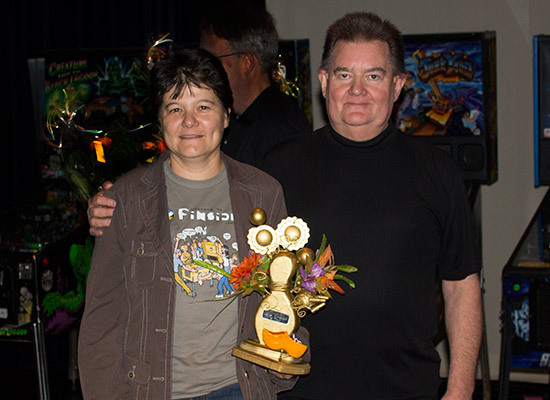 JP de Win created display animations for Jersey Jack Pinball's first title, The Wizard of Oz. 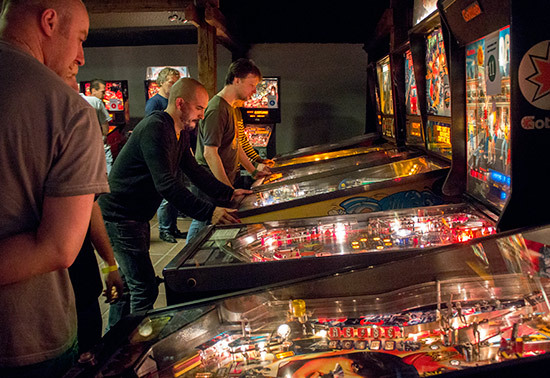 He is currently working on their second title, The Hobbit, but is responsible for both the display animations and the playfield artwork. He explained how the screen layout for The Wizard of Oz evolved, and how the processes and assets available for The Hobbit are very different. His original designs involved the use of circular windows to convey the shape of Bilbo Baggins' house, but this later changed to more Dwarfish straight line shapes, incorporating the map of Middle Earth and the player's travels across it. JP was then joined by Jack Guarnieri who also spoke about the development of The Hobbit. 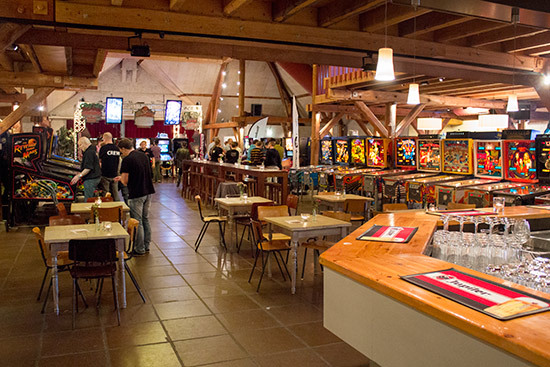 But Jack began by describing his visit to Freddy's Pinball Paradise in Germany and to Holland during this trip. He stressed how the The Hobbit machine out on the show floor is a prototype machine, with all the changes we described above still to come. 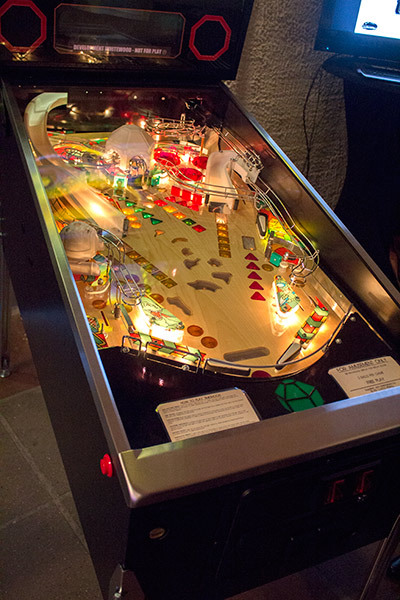 He said they have taken on board many of the suggestions received, and many had already been addressed even before the prototype was first shown at Pinball Expo two weeks earlier. Jack spoke about JJP's desire to be in control of their own assets and destiny. He said that is one reason they developed their own control system, and how he was looking forward to Pat Lawlor's game - the company's third title - as it is not a licensed theme and so they are able to do pretty much whatever they want with the characters and the imagery without needing to get approval from a licensor. In addition, because JP de Win's part of the seminar was highly visual, we grabbed our camcorder and shot a video of it for you. You can watch that below. Before the final presentation, Gerard made an announcement regarding the next title he will be making as part of Pinnovating.com. Having created The Matrix, they have chosen another movie licence for their follow-up game. 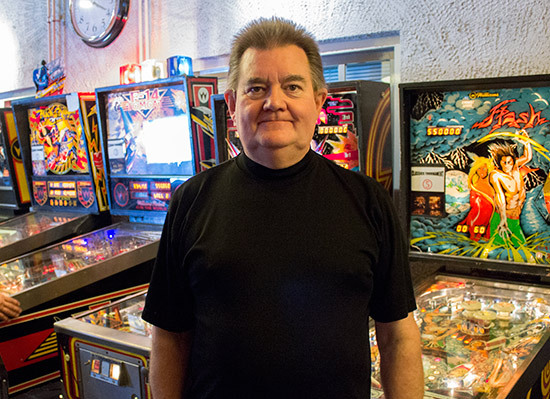 Then it was time for Steve Ritchie to look back on his career in the pinball business. 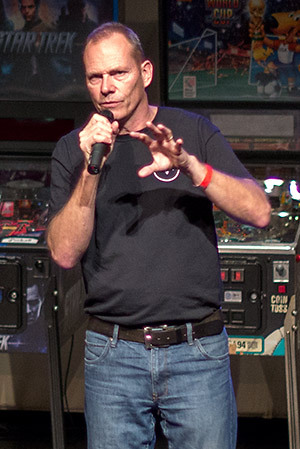 Steve gave a pictorial guided tour around the Stern Pinball factory, introducing the many people who work there and explaining their various roles. He looked forward to the company's move to their new premises in Elk Grove, scheduled for February 2015, saying he would have a larger office and, more importantly, a window. He spoke about the last machine he designed - Star Trek - and said how the code is currently unfinished but would be completed at some point in the future. He said he doesn't own any machines at the moment but will have a Star Trek Limited Edition, but only when the code is complete. 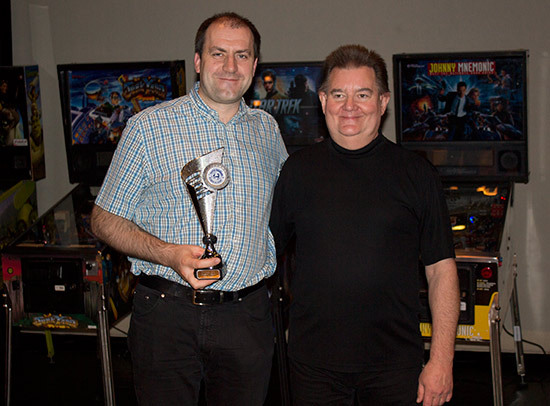 Steve also described the differences between working at Stern and at Williams, refused to talk about his next title, and revealed that he has a veto over any licence he works with, saying he has to be happy with it and convinced he can make a fun and attractive game from it. 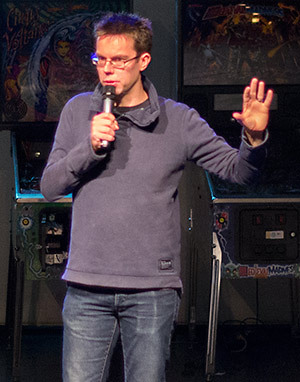 He described Airborne Avenger as his worst game, saying he was just a young punk trying to make a playable game using Atari's super-widebody format. Steve then stayed to autograph flyers, backglasses, translites, aprons and anything else visitors had brought along. And so we come to the biggest draw for a significant number of DPO Expo visitors - the tournaments. 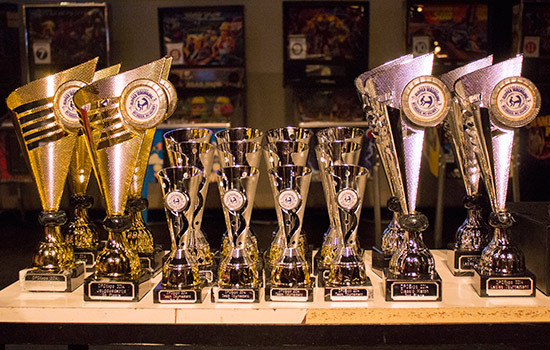 The first of these to begin and end was the Team Tournament. This started on Friday night - a time which prevented several teams from taking part but limited its impact on the rest of the weekend's events - and concluded on Saturday evening. 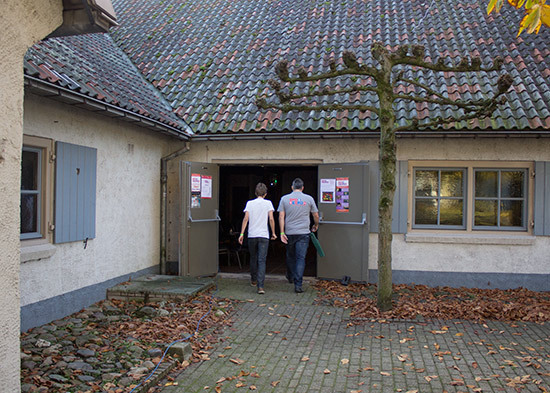 Held in the separate tournament room, the setting up of the main hall and theatre could continue while the initial rounds took place. The original start time of 7pm was pushed back to 8pm to allow teams more time to battle the Friday night traffic and reach the venue. 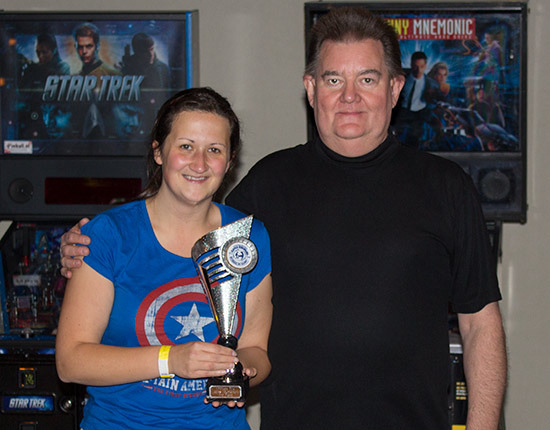 Entry cost €25 per team of four and the registered teams were split into two groups. 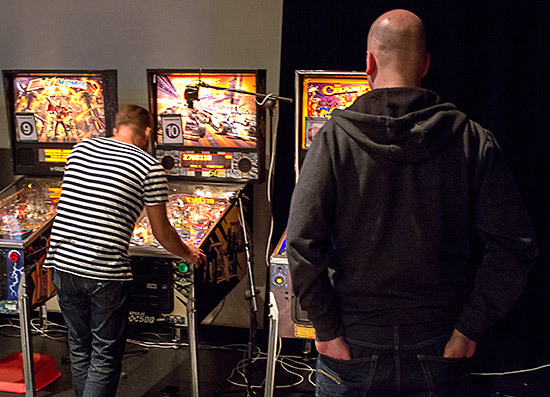 They played a mix of 4-player and split-flipper matches against the other teams in their group, with two players from one team playing two from the opposing team on one machine, while the remaining players did the same on a different machine. 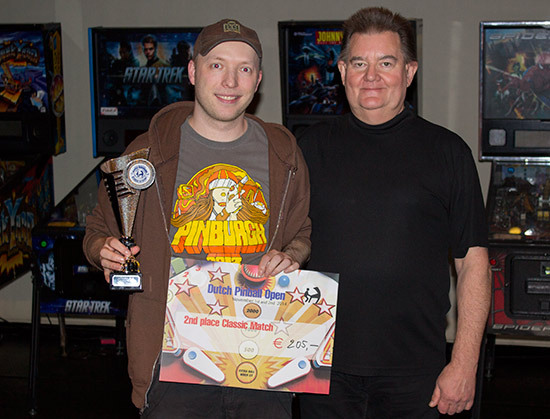 Points were awarded according to the finishing positions, and for winning the overall match against an opposing team. The two teams with the most points in each group progressed to Saturday evening's finals. 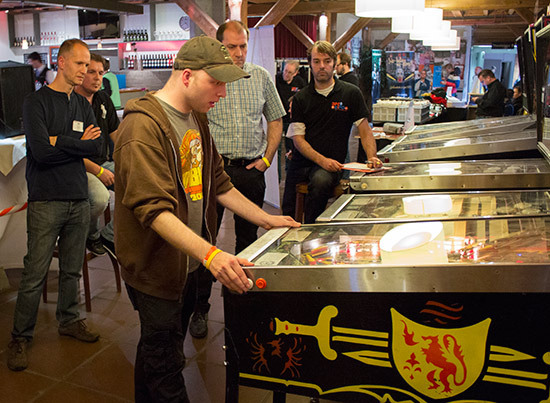 The final round began around 9:30pm, once all the Dutch Pinball Open qualifying had finished. 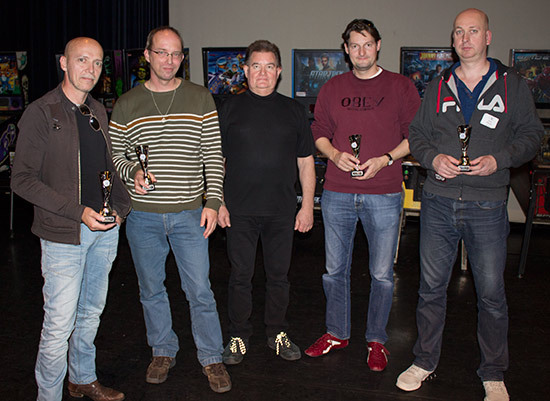 In that final, it was a win for the Amsterdam Pinball Masters (Martijn van Amsterdam,	Martijn van Aken,	Roy Wils &	Tom Loomans), who beat the Dutch Pinball Team (Albert Nomden,	Paul Jongma,	Dirk Klaver	& Joska Keunekamp) into second place, with Filthy Harold (Barry Driessen,	Koen Hetzel,	Jasmijn de Jong	& Cayle George) in third. 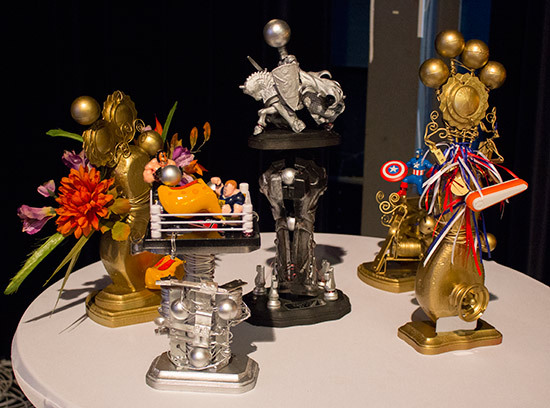 The awards were presented at the very end of the show, by which time some team members had left for the journey home. The Youth Tournament was competed next. It was divided into two groups - one for youths aged ten and above, and a second group for the junior players below ten years of age. 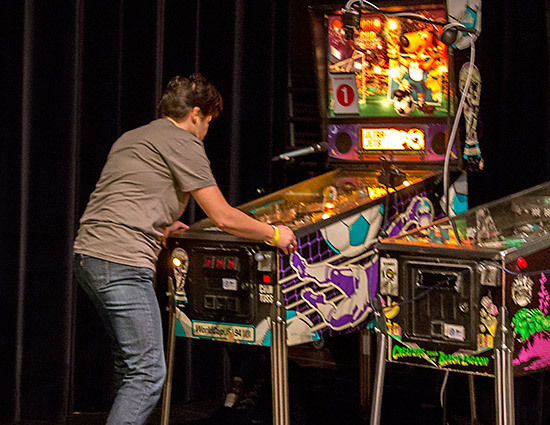 The whole tournament was played on Sunday on the machines on the stage in the theatre. 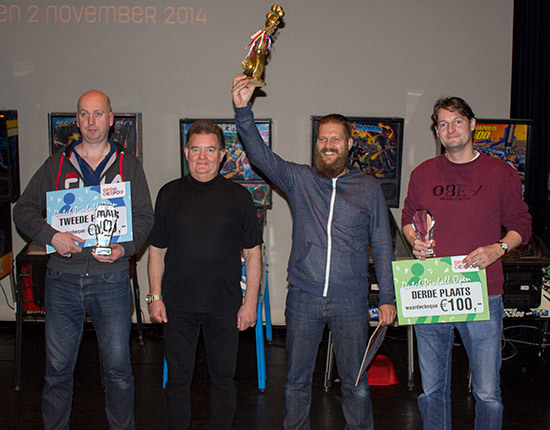 The winner was Pascal Schellen who beat Stella Rozemeijer in the final, with Joren Engelbeen in third. 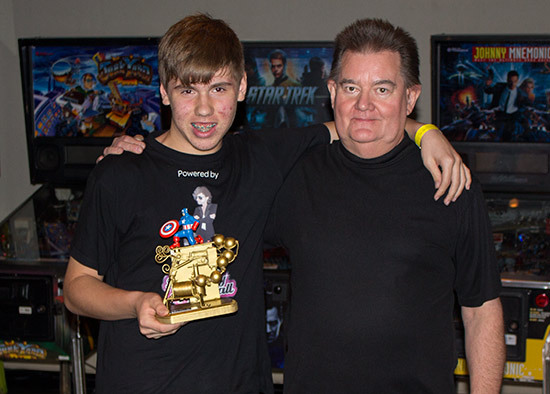 In the Youth Tournament, Thomas van Clapdorp was triumphant, defeating Timber Engelbeen in the final match, with Arthur Vissers in third. 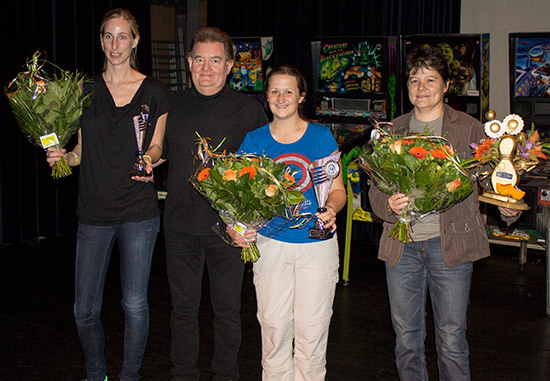 Then came the final of the Ladies Tournament which came down to a contest between Helen de Haan-Verbeek and Kate Morris. 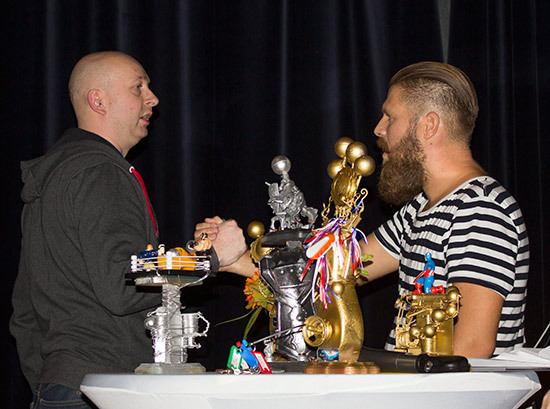 They each chose a machine in this best-of-three final. Kate chose Junkyard and Helen chose World Cup Soccer. Kate's choice of machine didn't work out for her as Helen took a 1-0 lead. Then it was Helen's choice of World Cup Soccer. Her selection was a good one, as she won the game and the final 2-0. Daniela Oymann was in third place. 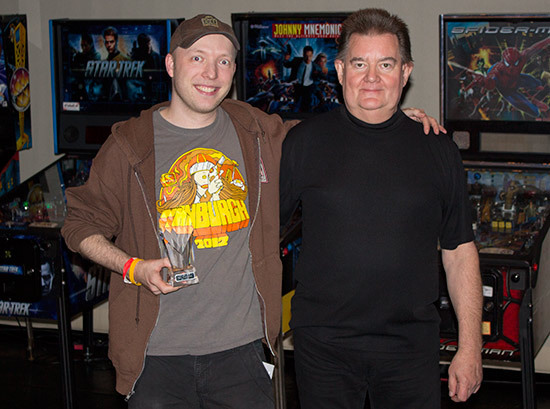 The classic tournament, called Steve's Classic Match, was the penultimate tournament to reach its conclusion. The final was a simple affair. 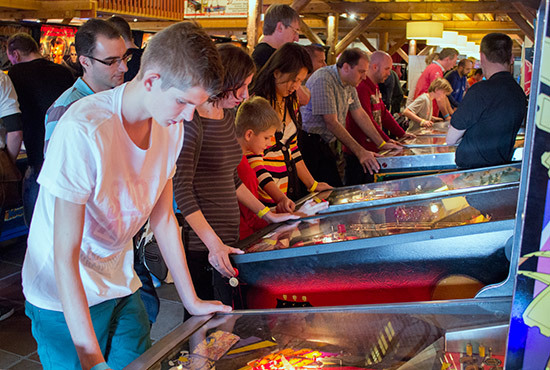 The four players with the best run of three games on any of the six classic machines took part in a single 5-ball game on Black Knight. The result would decide the top places. 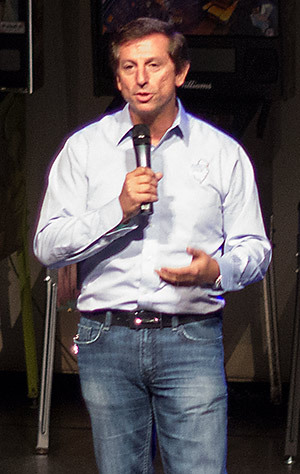 The players were Dirk Elzholz, Erwin Deutschländer, Greg Mott & Roy Wils. 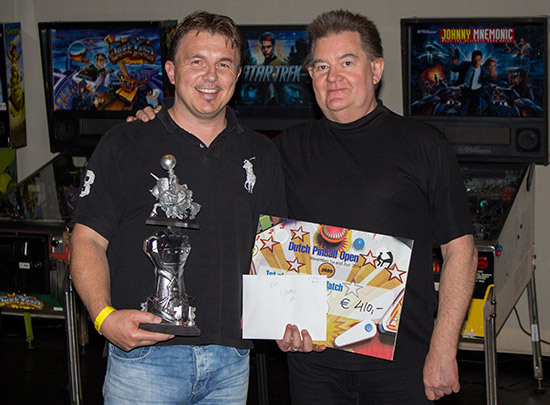 It was a close final, with Erwin Deutschländer coming out on top with his score of 1,518,020. 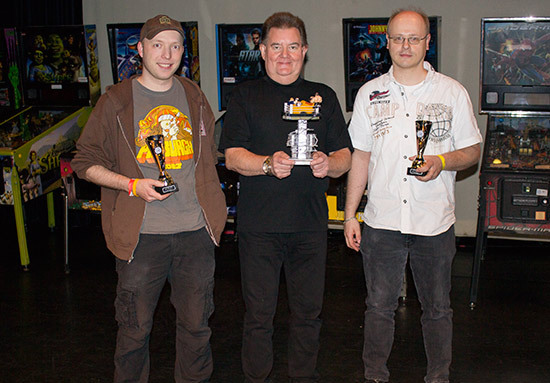 Roy Wils was second with 1,115,480, Dirk Elzholz was third on 966,170, while Greg Mott was fourth with 912,960. 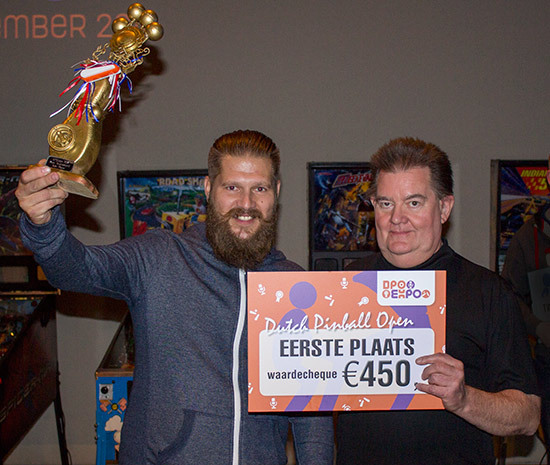 Just the Dutch Pinball Open final remained. 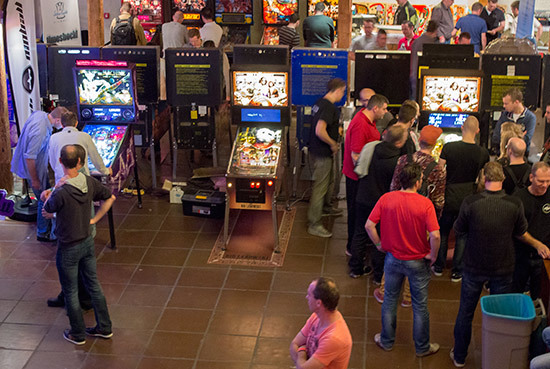 Qualification took place on Saturday from 9:30am until 9pm, and involved playing a single 4-ball game on any six of the twenty available machines. They could also play their 'joker' to replay any one of those six to try to improve their score. 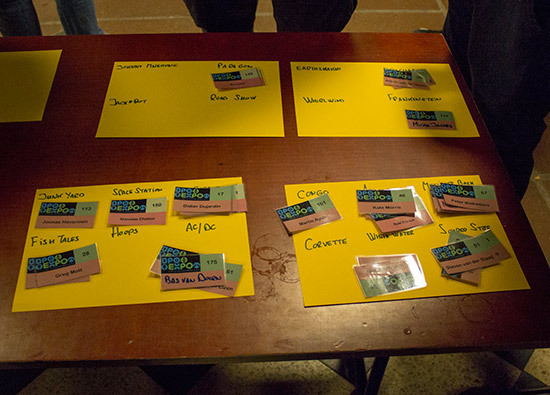 Players waited for their selected game to become available by putting their player card against the machine name at the tournament desk. 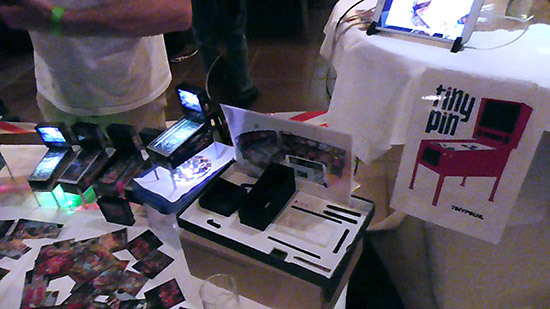 Scores were recorded on tablets and the overall standings were shown on a projector screen, with individual machine scores displayed on two side monitors. The top 48 players out of a total field of 173 qualified for Sunday's play-offs, with the top 16 earning a bye through the first round. The double-elimination play-off rounds began at 10am on Sunday for those without a first round bye. 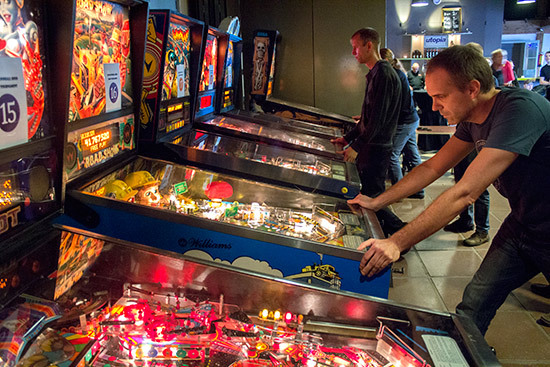 All matches were head-to-head best-of-three 3-ball games on randomly chosen machines. If anyone lost a match they dropped down into the loser bracket where the matches were single 4-ball games instead. Losing in the loser bracket got you eliminated from the tournament, but as long as you didn't lose for that second time you could keep going all the way to the final. The two who made it through to that final were Ralph Beckers and Dirk Klaver. 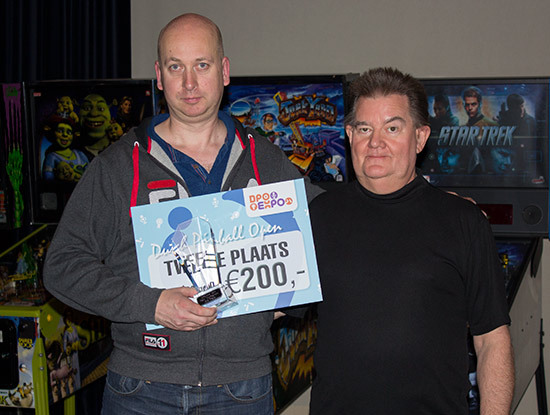 Ralph was undefeated in the winners bracket, while Dirk defeated Roy Wils and Paul Jongma to claim his place in the final. 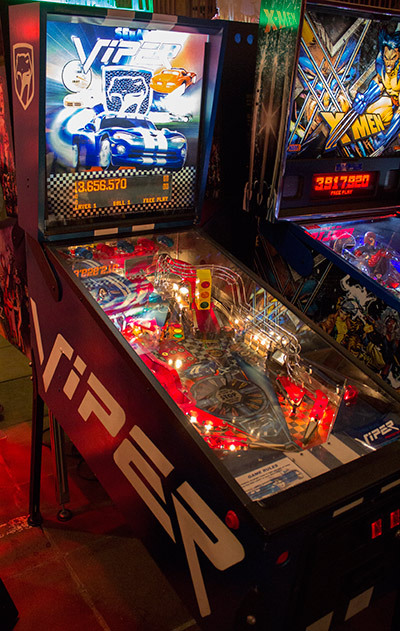 In the best-of-three final, Ralph got to choose the first machine they would play and he selected Indianapolis 500. 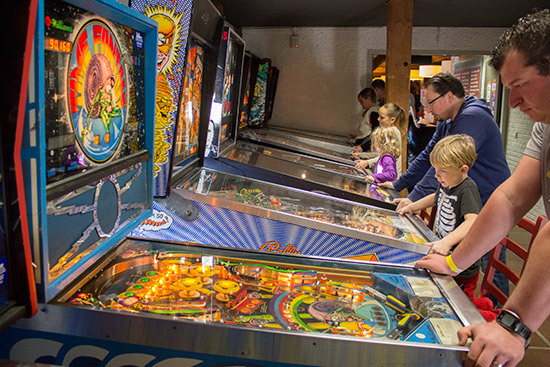 Dirk then chose World Cup Soccer as the second machine. Ralph then got to choose the third machine if it was needed, and he chose The Champion Pub. 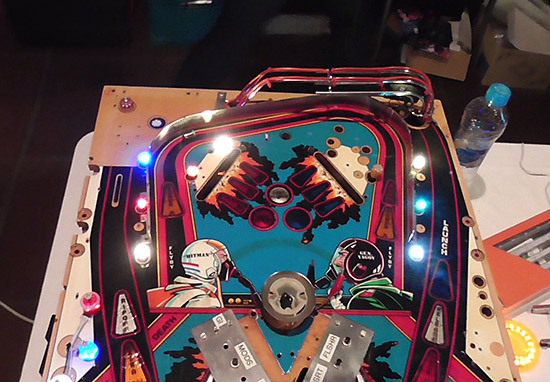 There was an initial hiccup where the power to the flipper button optos had failed, disabling the flippers, but after a short delay the final got under way. Ralph put up 174M on his first ball, compared to Dirk's 15M, but ball two only gave Ralph a slight boost to 212M. Dirk had his chance and pushed his score up to 272M. The third ball would be decisive, and Ralph would need a reasonable score to keep the game alive. It wasn't a great ball, but he ended on 332M, a lead of 60M. Dirk began the chase but his efforts were cut short by an early drain, leaving him 41M short on 291M. 1-0 to Ralph, so they moved over to World Cup Soccer for game two. Dirk had better luck on World Cup Soccer, leading after the first ball by 72M to 13M, a lead he strengthened with his second ball to push his total up to 349M to Ralph's 73M. Dirk's third ball total of 549M looked out of reach, and yet Ralph made a valiant attempt, ending his third ball and the game on 439M. With the score at 1-1, the deciding game would be The Champion Pub. Surprisingly, both players suffered quick drains, as the score after ball one were 112K to 70K in Ralph's favour. Ball two was a little better for Ralph as he finished with 4.96M, while the bad luck continued for Dirk, giving him only a minor boost to 373K. Neither player had set the game alight, but Ralph did better on his third and final ball, ending his game on 13.2M. Would Dirk finally get a break and start chasing the relatively modest target? In fact he did get a good shot at that 12M, but fell slightly short with 8.66M, making Ralph the winner. 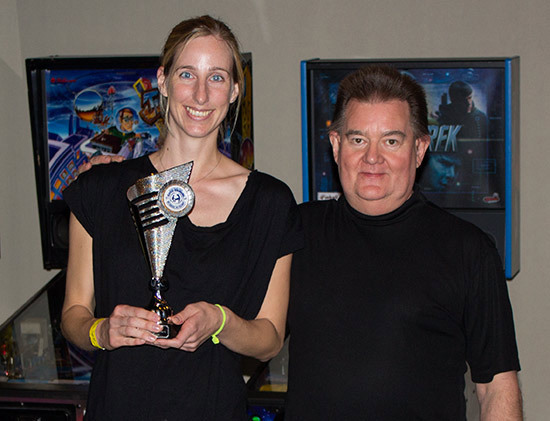 Shortly after the final, the trophies and prizes were awarded. Here are the results for the top 48 players. Those in qualifying positions 49-173 ended in their qualifying positions. 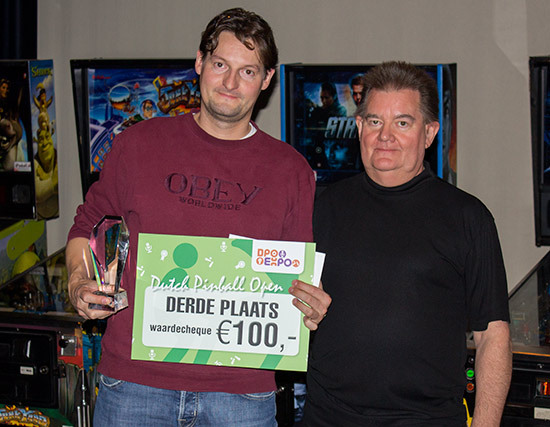 And with the results of the Dutch Pinball Open we bring this report from De Voorste Venne in Drunen to an end. There were worries from the organisers about whether the expanded DPO format would be well received by visitors, and if the seminars would draw enough attendees. They need not have worried. The seminars had a sizeable audience while the speakers made some entertaining presentations. 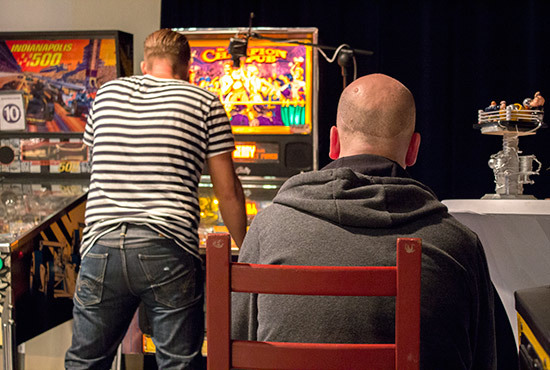 It wasn't clear in advance whether the talks by Silver Castle Pinball, Dutch Pinball and Jean-Paul de Win would be in English or Dutch. As it turned out, two were in English and one was mostly in Dutch. The use of space within the building was much improved this year, learning the lessons from last year. 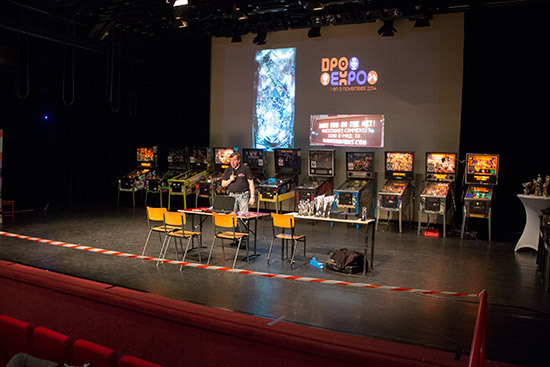 Moving the DPO into its own room did create a sense of detachment from the rest of the show (it is called the DPO Expo, after all) which made it unlikely many non-tournament players ventured inside to watch, but it was easier to control and allowed the machines to be set up and played without impacting on the other events. We would just ask for a little more light in the DPO room, as it got pretty dark when playing certain games, and perhaps move the results screens away from the entrance to the playing area to prevent those who had completed their games blocking those trying to play. 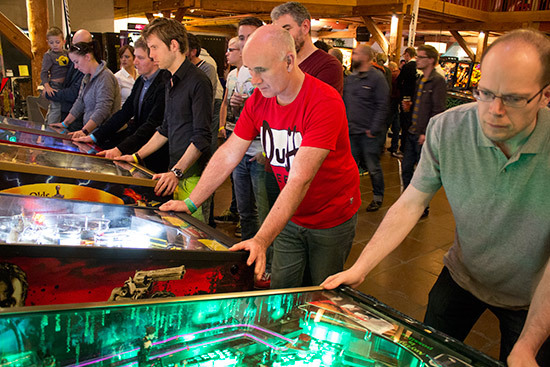 The new electronic scoring system for the DPO qualification round used a slightly modified version of the system devised for the UK Pinball Open. It certainly speeded things up and seemed to go without any hitches. There was also a nice short-throw projector used, which managed to create a 50-inch 720p picture while being positioned just a couple of inches away from the screen, eliminating the problem of people walking between the projector and the screen. 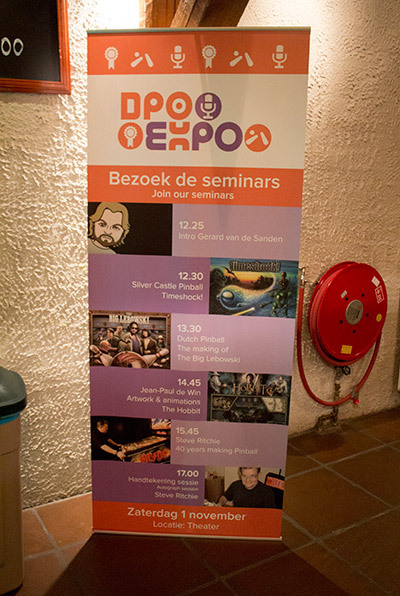 The golden time for new pinball makers, and especially those based in the Netherlands, was well represented at the DPO Expo with Dutch Pinball and Silver Castle both showing off their projects, while Ministry of Pinball and Freddy's Pinball Paradise were able to show the current and upcoming titles from Stern and Jersey Jack. The number of parts purchased and brought home by our group also suggests this was a good show to pick up assorted parts from the many vendors present. So overall this was an impressive step up from the regular DPO, which was already a well-run event. The large team behind it must be congratulated, even though they have made a rod for their own back as there's no going back to the 'plain old' DPO now.